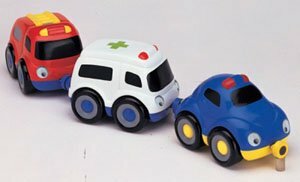 Emergency vehicles that link together for following fun! Three cute emergency vehicles-- ambulance, fire truck and police car. Plastic cars have axles and wheels for true rolling action. Magnetic connectors at front and back of vehicle.